Mary Lee Brown was born September 8, 1929 in Jackson, Tennessee to Dave and Rosie Embry who both preceded her in death. She moved to South Bend, IN., at a early age. She married Cleveland Brown, Sr., in 1945. Mary attended school in South Bend. She graduated and received her beauty license from Vogue Beauty School. She worked for Suzies Twist a Curl for many years. For several years she worked from her own Beauty Salon. Mary loved bowling and played on several bowling leagues. She loved arts & crafts as well. She made beautiful quilts. 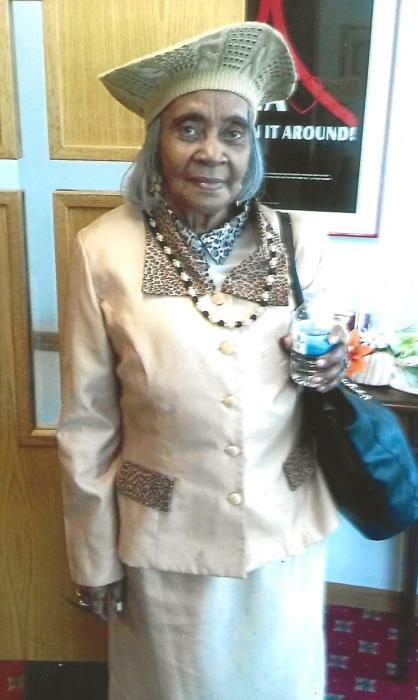 Mary was a long time faithful member and usher at Greater Friendship Missionary Baptist Church. She loved her church family and Pastor. Mary was preceded in death by her husband the late Cleveland Brown, Sr., two sons; Cleveland Brown, Jr., and Clarence Brown, one daughter; Gertrude McQuery, two brothers; Issac Newbond and Tyler Osler and two sisters; Yuramae Witherspoon and Earlene Fuller. Those left to cherish her memory include seven sons; Johnny (Mickey) Brown, Eddie (Zudie) Brown, Christopher (Kathy) Brown all of South Bend, IN., LeVester (Karen) Brown of Dallas, TX., William (Andreanna) Brown, Clayton (Lisa) Brown, Jessie (Robin) Brown all of Atlanta, GA., three daughters; Cleora Brown of Minneapolis, MN., Joyce (Maurice) Griffin of Brooklyn Park, MN., and Vera (Robert) Guest of Ackworth, GA., two daughter in laws; Doris L. Brown of south Bend, IN., and Nelda J. (Henry) Clay of Mishawaka, IN., along with grandchildren, great-grandchildren, a host of nieces and nephews, other relatives and friends. A viewing will be held at Greater Friendship Missionary Baptist Church on Friday, November 16 from 5 to 7 PM. Services will be held Saturday, November 17 at Greater Friendship Missionary Baptist Church at 11 AM.